On the first day of school, I was trying to run to my 9am grade 5 English class. All I wanted to do was to go over rules for my class. That is, until I ran into my English counterpart. “No, Lizzy! You must do a lesson plan and submit it to the HOD,” my counterpart urged. “No, Miss Molefe. I will do it after my class because it is starting now. I already wrote down in my notebook what I want to teach.” I responded. “Lizzy, you must do a lesson plan! You must! You cannot go to class. What if the monitors come? !” she said, with a startled and frightened look on her face. Politely, I went to ask the HOD (Head of Department — the American equivalent of a vice principal) if it was okay to go to class without submitting a plan (especially considering I’ve only ever seen my counterpart write one). She agreed, with a bewildered look on her face — why was I even asking? I told my counterpart that it was okay to calm her nerves and went onto class. Bless her soul, because my counterpart was looking out for me. She didn’t want me to get in trouble. I understood that at the time, but as time passed during my first couple of weeks working as part of my school’s staff I began to understand a larger cultural clash: The “royalty of rules”. Many South Africans I have crossed paths with are inflexible and will not budge if it means not following a rule. There’s no such thing as “substitution” here. Rules are royal. The laughable moment of the “royalty of rules” was when some of my friends and myself were at a fast food restaurant. We ordered a combo that was supposed to come with a bigger plastic-bottled coke. There weren’t any cokes left in that size, but we still wanted a coke. We asked the lady if we could substitute the larger bottle for a smaller can of coke. No way Jose, no way. In our minds, that would have been okay because if you look at the situation logically the restaurant would have actually made profit. But that’s not what we ordered. So there’s no way that could happen in ZA. In American schools, critical thinking is taught. We are able to evaluate issues and look at the pros and cons. We are able to draw logical conclusions and reason with others. Historically, in South African schools, learners were taught by the books. My co-workers were educated during Apartheid — their classes consisted of taking notes, copying more notes and not asking questions. Wa-lah! It’s no wonder they work by the books — it’s ingrained in their culture. I gave my grade 5 English students last year’s district-wide final assessment for grade 4 English as a diagnostic exam. 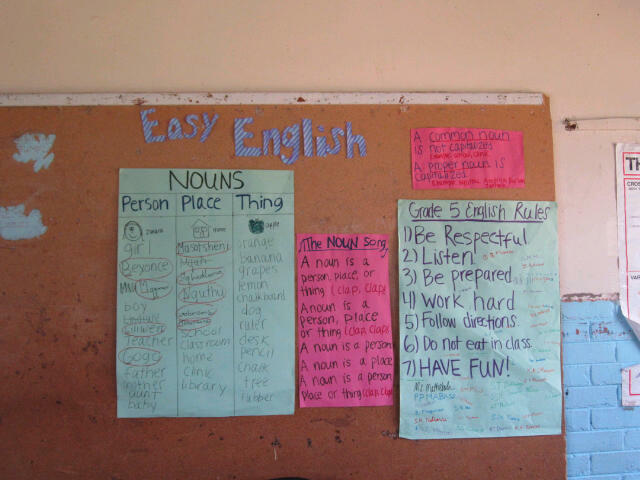 The exam covered topics they learned in grade 4, like past tense, nouns, future tense — ya know, all that grammatical English gibberish that native speakers don’t even notice. The class average was 15 percent. The learners could not write in complete sentences and did not understand the stories they read. Some even copied the directions (just random English words to them) in the blank spaces where they were supposed to write a part of speech. Reminder: they are supposed to be at a grade 5 reading level similar to the States. Instead of getting depressed, their exams actually pumped me up. Reason being, I can change the rules because I am not scared to. The grade 5 curriculum is unrealistic for them to complete at this moment. So, rather than digging them deeper into hole, I can go back to basics. I can glance at the curriculum and hit the requirements for the two-week teaching cycle, but focus on concepts from lower grades. Want me to read to them? Sure. Want me to discuss what happened? How about we try do that, but focus on underlining common and proper nouns — a grade 4 concept? It’s all about getting creative and merging the lower English concepts they should already know with stuff they should learn. My counterpart, or anyone else I work with, would never do such a thing because it doesn’t directly follow the curriculum book. This approach wouldn’t make sense to them, but it makes sense to me. And it’s what these kids need. Maybe, hopefully, one day, in my dreams, my counterpart will catch on. If I give my learners some easy questions or grammar concepts and they get it right, they get extremely excited and all want to participate. During reading time, they asked me (in Zulu, unfortunately) if they could read in front of the class. Learners were fighting over getting up there to read in English, even though they can’t comprehend what they are reading. Instances like this make them feel smart and think that they know English. It’s cute and shows me that they want this, but it’ll just take a while. Lesson learned — give them some easy stuff that will catch their attention the try to work on harder stuff. My students can listen to English and somewhat understand me because I talk in my “village voice”. LOUD, slow, pronounce every word and use hand gestures and movements. Sometimes I feel like a mime, which I might as well become because I’m losing my voice from talking so loud in class. Most learners tighten up and look at me like a deer in headlights when I ask them a simple question and want them to respond in English. From my experience with Zulu, I know the first step to learning a language is listening. I can listen to Zulu and understand some of it. However, if I want to respond to a question I automatically think of the answer in English and have to try to translate it in my head. I could read a page of Zulu and pronounce some of it right, but would I comprehend it? Absolutely not. My language experience here has helped me understand their difficulties. I’m proud that I’ve caught onto most of their Zulu names, although I can’t pronounce some, including that one kid — the universal disruptive one. But I’m prouder to diss the rules of royalty in this rigid country. Now, back to fighting to catch these kids up.